Creating a more beautiful subway map for Tokyo wasn’t easy. Photo by aka.me on Flickr. A selection of 9 links for you. Smoosh them. I’m charlesarthur on Twitter. Observations and links welcome. Industry experts think that consumers will be slow to purchase autonomous cars – while this may be true, it is a mistake to assume that this will impede the transition. Morgan Stanley’s research shows that cars are driven just 4% of the time, which is an astonishing waste considering that the average cost of car ownership is nearly $9,000 per year. Next to a house, an automobile is the second most expensive asset that most people will ever buy – it is no surprise that ride sharing services like Uber and car sharing services like Zipcar are quickly gaining popularity as an alternative to car ownership. It is now more economical to use a ride sharing service if you live in a city and drive less than 10,000 miles per year. The impact on private car ownership is enormous: a UC-Berkeley study showed that vehicle ownership among car sharing users was cut in half. The car purchasers of the future will not be you and me – cars will be purchased and operated by ride sharing and car sharing companies. And current research confirms that we would be eager to use autonomous cars if they were available. A full 60% of US adults surveyed stated that they would ride in an autonomous car, and nearly 32% said they would not continue to drive once an autonomous car was available instead. Today’s children are the last generation that will have to pass a driving test. Think about that briefly. Then read the rest of Kanter’s piece. (It’s actually optimistic, overall.) And one more thing: it doesn’t have to be about Uber. For many designers, creating a better subway map is an irresistible puzzle — “infinitely alterable, incredibly vexing, with no definitive answer,” writes Emily Badger. Badger’s new article looks at some amazing examples of metro maps from the frontier of design, including the beautiful 2010 diagram of all of the rails in the Tokyo region, designed by Kim Ji-hwan. If you want to buy a cheap Android-powered tablet, and you’re searching for it on Amazon, the best thing you can do is carefully read all the negative reviews you can find. If you are lucky, you’ll see some that will warn you about the device being rooted and coming pre-installed with malware. Security researchers from Cheetah Mobile have recently discovered a slew of these devices – over 30 tablet brands in total – being sold on Amazon and other reputable online stores. Here’s a short overview of affected devices, along with a sample of reviews warning about the malware. The malware in question is the Cloudsota Trojan, which allows remote control of the infected devices and conducts malicious activities without user consent. Remember, a Trojan is for life, not just for Christmas. Estimated that over 17,000 have been sold. the ecosystem of partners that build and sell Android phones has matured to some extent; those companies have 1.4bn customers (there’s one third as many iPhones in customer’s hands, by contrast). While many of those customers aren’t necessarily loyal, and surprising upstarts are gaining ground, Google won’t be able to suddenly capture a significant amount of market share with a better device, at their expense. (It would also risk its chance to return to China, given that it is working with local handset brands to do so.) There is no going back. Even if Google wanted to compete on price by offering devices cheaper than the iPhone, it would still have to engineer a marketing apparatus so impressive that it convinces smartphones buyers that the Google phone is the best in the world. That’s the only way it could convert iPhone and even some Samsung Galaxy S users — who are wealthier than typical Android users — to the Google phone. Good luck with that. Then there’s the fact that prices for phones have come down so much as components become cheaper that it’s become exceedingly difficult for existing Android phone brands to stand out in the market. Even if the Google phone struck a chord, it’s hard to see it selling more than tens of millions of devices in the next few years, and that’s optimistic. I can believe that Google is interested in designing ARM architecture chips. But I think it’s more likely considering them for its server farms. People inside Google already know Efrati’s argument (which holds water). Sundar Pichai is hardly the sort to hang on to an idea for pride. He killed Google+, remember? We take those terrible, misleading ads that take you to garbage websites (or worse!) and switch them out for real-time, human-curated headlines and links from ONLY the most trusted, reliable websites. Sites that never end in best-deals-4-everyone.ru. Sites that never pop up 8 windows asking if you’re SURE you want to click away. Just sites you like and stories you want to read, all seamlessly integrated into your browsing experience before you even notice it’s changed. Doesn’t that sound nice? Neat idea; Chrome extension only for now. Adding facial recognition to Messenger may seem odd given that it’s primarily considered to be a messaging app, but when you consider that people send a staggering 9.5 billion photos through Messenger every month, the decision begins to make more sense. Australia only for now, but your feeling on whether this is creepy or great will probably depend on age. Note though that it’s machine learning/AI being deployed as utterly normal; even five years ago this would have been hard to implement on such scale. On paper, 12.9 inches may not seem much bigger than the standard iPad’s 9.7 inches, but the Pro screen made me more productive. I spent much of my week writing in Microsoft Word on the left hand of the screen and toggling between websites and my inbox on the right. Text looks incredibly crisp, especially in comparison with my MacBook Air’s display, which has just half the pixels. The A9X processor and 4GB of RAM kept those apps running swiftly. But most impressive? When I exported the same 4K video in iMovie on both the Pro and my Intel Core i5-powered MacBook Air with 8GB of RAM, the iPad reached the finish line a minute and a half faster. And, unlike the Air, it didn’t sound like it was about to blast off from Cape Canaveral. For real work, it’s all about attaching Apple’s $170 Smart Keyboard. You don’t do this via Bluetooth, but rather with the new magnetic Smart Connector. I quickly fell in love with the feel of the bouncy fabric keys, and it became second nature to hit Command+Tab to toggle between apps. Oh, and did I mention the keyboard is spill-proof? Seriously, my iced latte just wiped right off. …Despite iOS 9’s improved multitasking, there are still shortcomings. You can’t customize the home screen’s comically large icons with files or other shortcuts. You can’t place the same app—say two Safari windows—side by side. And iOS’s lack of real file management can be maddening. 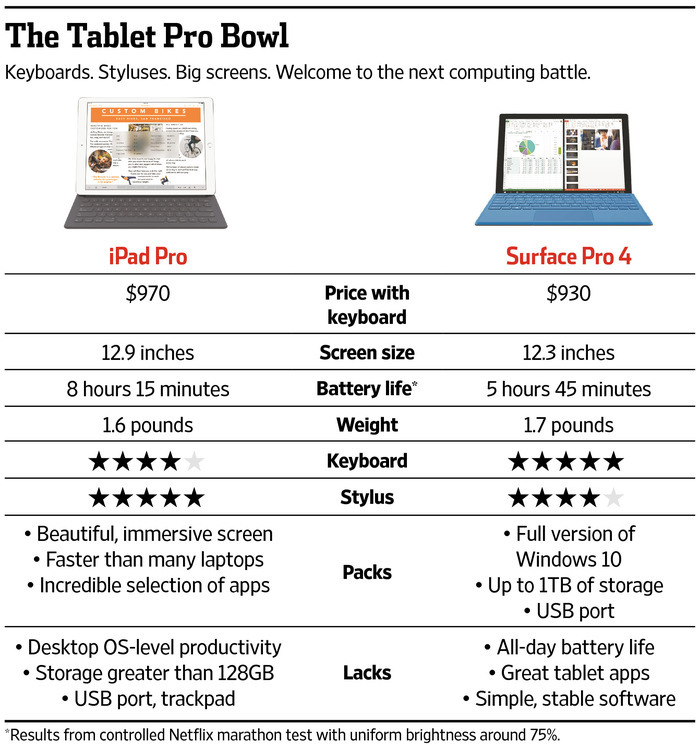 Microsoft saddles its Surface Pro with full-blown desktop Windows while the iPad Pro is still too closely related to an iPhone. Apple has to keep working to find the happy middle. There’s one thing the iPad has over all other laptops and competing tablets though: incredible apps. The Pro helped me realize that I’ve been living in the past, using legacy desktop programs to accomplish things. The Internet Assigned Numbers Authority (IANA) is a department of ICANN, a non-profit private corporation that oversees global IP address allocation, the Domain Name System (DNS), well-known ports, and other Internet Protocol-related symbols and numbers. During March of 1990, they published a document (RFC 1060) where they listed all the well-known ports at that time. In that list there was no protocol assigned to port 80 (it jumped from 79 to 81). 79 was assigned to “finger” (find out if someone was online) and 81 to HOSTS2-NS, the HOSTS2 Name Server. HTTPS? Lost in time. Blamed on someone at NCSA Mosaic. So there’s your pub quiz question/answer pair. • Family membership sign-ups and upgrades require Mac or iOS. Notable that it hasn’t attracted the hate reviews that the “Move to iOS” app did; there are actually a lot of five-star reviews. (Average 3.1.) The key element looks like the “family membership” element; that’s a really powerful reason for Apple to want to reach Android users – because families are mixed users. This entry was posted in links and tagged ai, apple, facebook, google, ipad, ml, music, selfdriving, smartphone by charlesarthur. Bookmark the permalink.